This review originally appeared on my blog, Books Without Any Pictures:http://bookswithoutanypictures.com/20...Kayla is a GEN, short for Genetically Engineered Nonhuman. The GENs were engineered by the higher classes to do manual labor and are basically cyborg slaves. Kayla has been given the opportunity for a treatment that would dissolve her circuitry and let her pass as a member of a lower caste, but she’s turned it down repeatedly in favor of others who she feels need it more than she does. Instead, she continues her work in the underground resistance that’s dedicated to helping the GEN. But then mysterious bombings start occurring throughout the city around warehouses. Near each of the bombings, Kayla reads the phrase “Freedom. Humanity. Equality.” written on a wall.Awakening definitely feels like a book two, and I didn’t feel as hooked as I did while reading Tankborn. It’s not that it’s a bad book, but rather that the first book was so strong that this one feels like a placeholder. Here are some of the elements of the story that stood out to me the most, both good and bad:I didn’t like the way that Kayla and Devak’s relationship is progressing. Devak is pulling away from Kayla and won’t accept her for who she is. He can’t see past the fact that she’s a GEN, and even if she were to pass as a lowborn, he cares so much about his standing in society that he won’t take the fall to be with her. I think Kayla deserves better. She needs someone who sees her for who she is, not what she is.I did enjoy the fact that Kayla starts to come to terms with the fact that she likes being a GEN. Not the social constraints that go with it, but she’s realizing that as a GEN she has an identity that’s more than just a slave. Kayla starts to realize that she doesn’t *want* to give up her circuitry and the enhanced abilities that come with it, and that’s a good thing. She shouldn’t have to change her very identity to be treated like a person.I was also intrigued by Kayla’s growing disillusionment within the resistance. At first, working with them seems like a wonderful opportunity, but then as the story progresses Kayla starts to see that even within the resistance the GEN still aren’t treated like equals. The resistance wants them to be free, but doesn’t consider them to be the same as everybody else, and even within the organization, one’s social class determines one’s influence.All-in-all, I like the idea of Awakening more than the execution. I love the fact that there’s a young adult series that’s built around issues such as race and class, but I felt as if this book ought to have been stronger. I do plan on continuing the series, and I look forward to reading Rebellion. Tankborn, the first book in this series, set me on fire. I loved the storyline, the concept of a dystopian future where a group of Earth émigrés set up an exacting caste system when they colonize a new planet. The castes begin with Highborn Trueborns at the top, and untouchable Gens (people born in tanks whose DNA has been combined with animal DNA to endow them with certain skets – skill sets) at the bottom. Skin color is an integral part of the system, Highborns have a perfect brown tone. Anything too light or too dark is lower on the ladder. The facial tattoo distinguishes a GEN. They may be any color. A romance grows between Devak, a Highborn, and Kayla, a GEN assigned to work for his family. They both learn some hard truths about reasons for the caste system, the real origin of GENS, and Kayla’s personal history. A conspiracy is uncovered, and Kayla barely misses out on a chance to take one step up the caste ladder and become a Lowborn. Instead she joins an underground movement seeking to improve the lot of GENs.Awakening takes place some months later. I started the book, eager to see what would happen next. Unfortunately Awakening suffers from pacing issues. Kayla wanders around the countryside, and the pages. Her role with the Gen underground has her traveling and delivering messages and supplies. But the story seems to take one step back for every two steps forward. A disease is running across the land, striking only GENS. Sick GENS are being rounded up and taken away. At the same time there is a new drug available for Highborns, one that can restore strength and fitness. Devak’s grandfather is both a member of the underground seeking to help GENS and a recipient of this medication. Yet no one seems able to connect the dots between these developments.Likewise, although Kayla is suspicious of the new Gen who joins her caravan, she never acts. At times his actions were so obvious I wanted to reach into the page and grab her and make her take another look at what he did. Coincidence should only be accepted for so long.Then there was Devak, also a member of the underground. The first time he lamented on the impossibility of there being anything between a GEN and a Highborn, I sympathized. But it happens every time the story enters his point of view. During the long road to the solution of several intersecting mysteries there are many detours and false starts. I have a feeling that if someone had just cut out about a hundred pages, this would have been a smooth, book; a real page-turner. I still want to read book three, but mostly I hope it regains the vitality of book 1. Just your average second book in a series. The lovers face obstacles that are only relevant to themselves, they're apart the whole time, there's a lot of travel, unnecessary twists, and new gay characters. First, I wanted to thank Netgalley and the publisher for allowing me to read an advance reader copy of this book in exchange for an honest review. This book picks up some months after the events in Tankborn. Kayla is part of an underground movement working toward freeing GENs from the life of oppression. Kayla, along with her lowborn companion, travel from sector to sector retrieving and delivering information for the kinship (a network of trueborn, lowborn, and GENs working together). While Kayla believes her overall work is good, she wonders if the kinship is truly as dedicated to this cause as they say. Are they truly willing to risk so much for GENs? She knows that most members of the kinship, no matter their social rank, hold her in high regards, but she wonders if this because she's proven herself. When they look at her, they see an individual. She's not some insignificant GEN girl. Kayla also continues to struggle with her feelings for Devak, the trueborn boy whose grandfather (and prominent member of the kinship) she cared for in Tankborn. There many things going on in this book. I mean, the last book had a couple of different issues going on, but they seemed to connect together from the very beginning of the story. Some of the things introduced into this story didn't feel like they fit anywhere at first and didn't really pull together until toward the end of the story where things seemed to progress at a rapid pace as the author tried to wrap the loose ends. There's nothing wrong with everything not coming together until later, but it made some things feel so rushed even though their impact on the story and what they mean for the people involved is important. I didn't feel like this was as intense as the last story was, but overall, I felt this was still a solid story about the struggles surrounding the GENs, I know this a young adult book and you have to have romance, but I got a little tired of Kayla and Devak's song and dance. I realize their relationship is extraordinary and nigh impossible. The societal pressures and laws that threaten to keep them apart weighs heavy on their hearts. This causes them to make decisions and mistakes that draw them further apart, though I did like Kayla's speech that Devak couldn't decide what was best for both of them without her input. So much of her life has been spent with her choices being stripped from her by people that "know" what's good for her. She wasn't willing to accept that in a relationship with someone who supposedly cared about her. However, it didn't feel like Devak really understood what Kayla was telling him instead he begins to nitpick and take what she said out of context. I guess I can understand since he's used to being listened to and doted on. It's hard to see where privileged behavior comes in at times when you're used to things going your way. However, it just felt a little disappointing and typical of someone with status. In any event, I felt like their drama just really took away from the story at times. I think it could've been streamlined into the story more. I wish Sandler spent a little more time world building. It seems like she's created this wonderful place, but we only get to hear about some of its nuances from time to time. From the first book, I knew they had two named suns, but it wasn't until this book that we learned they also have two moons. Also, the religious beliefs of the various social classes should be explored more since the trueborn don't believe as the GEN do, and the lowborn have their own take on what the GEN believe. And religion plays an important part of the story in these books, especially what the GEN believe.After the ending of this book, there's no doubt there will be another. It ended on a very tense cliffhanger, and I'll definitely be awaiting the next book. Tankborn was one of the first books that I read for review when I started writing for Midnight Reads so I have a soft spot for this series. It’s probably also why it feels as though I have been waiting forever for the sequel to be released.In the first book in this series Sandler really focussed on the story of Kayla, how her place in the world changes, her budding relationship with Devak and throughout the story we see her develop to become a stronger independent woman by the time the story draws to its temporary close. In Awakening the story takes on a much wider viewpoint. The disease, Scratch, which affects and kills GENS, is spreading wildly and even as those around her are dying a political uprising seems to be taking hold as the phrase Freedom. Humanity. Equality. begins to appear through the sectors that Kayla works in with Risa. When you look even deeper it would seem that even those individuals who claim to be pursuing equality for GENS like Kayla are actually using them for their own benefits whether they wish to see it or not. There is an interesting mix of characters in the Tankborn series. I particularly like reading about Risa and Kayla. They both portray a strength that I wish more female protagonists had. I also liked Abran and the little fliratations between him and Kayla, although I found some of the plot surrounding him to be a tad obvious. For me it was the complexity of his situation and the reasons behind his behaviour that I found intriguing and I kind of hope he pops up again somewhere in the future. I also liked Junjie, mainly for the loyalty he displays to those he cares about. The one person who disappointed me was Devak. At the beginning of the book his budding relationship sours and whilst he argues that he isn’t with Kayla purely because he wants to protect her I can’t help but feel that his behaviour is most triggered by his own fears of the potential repercussions he might face. I hope he sorts himself out for the next book or I won’t be pleased! It took me a while to get into this book, mainly because of the gap between the two publications and the unique language that Sandler has developed that does give it an ‘other-wordly’ feel but also means that you might be flipping back to the glossary from time to time to remind yourself of the meaning of certain words phrases etc. The story winds along at a slow comfortable pace until you get to the final couple of chapters and then everything begins to take off at a lightning pace, indeed I think it’s the final chapters that really up the ante for this sequel. After the ending, well I can’t wait until the next instalment is published. Hopefully, we won’t have to wait as long next time around. Rating: 3.5/5 If you enjoyed Tankborn you will enjoy this sequel. Now book three is due out when exactly? Pros: great characters, complex story, multi-racial castCons: Kayla and Devak's waffling with regards to their relationship got a bit irritating, several plot twists were obviousIt's been several months since the events of Tankborn and Kayla misses Devak. He's been avoiding meeting with her and she's not entirely sure why. Her transport job with Risa has kept her from visiting home and though she's done a lot of work for the kinship, transporting information and materials, she's not as sure their goals are in line with hers anymore. Two other matters concern her: the spread of the Scratch, a plague that only infects GENs, one their internal circuitry can't cure, with a 100% mortality rate. That is, 100% until one victim came back to life with the ability to heal others. And the graffiti scribbled on the door of a warehouse that blows up: Freedom. Humanity. Equality. This is a great book with a series of complex, interconnected plots. The characters are great, with a mix of races represented, and a positive portrayal of a lesbian couple. Kayla's dealing with several issues, both in her love life and with regards to her treatment by the kin. She's fed up letting people mess with her brain without explaining what they're doing, even if it's just to transport information from one group to another.While I found her relationship issues with Devak a bit irritating over the course of the book, I acknowledge that it's a realistic portrayal of how two sixteen year olds react in the face of challenges they hope - perhaps without hope - to overcome. Devak's realized just how hard a relationship with a GEN would be, and even if Kayla took the treatment that would turn her into a lowborn, a life together would be difficult. She meanwhile feels he's making decisions for her, just like the other trueborns in the kinship.Some of the plot twists were fairly obvious, but that didn't make the book easy to predict. There were a number of twists I didn't see coming, particularly the cliffhanger ending. Haven't read the first in the series so making up ground and I liked the premise of the story - GENs are artificially engineered people born in tanks to do the bidding of the highborns and the lowborns. The society is highly ordered and strictly adhered to but there is an underground movement trying to make things better for the lowest elements. And of course there is a Romeo and Juliet style love affair going on between a high born and a GEN! I think the first book was probably better - this one had to carry on the story (and the love story was getting a tad annoying by now - does he love me???) and find new elements whilst trying to explain the intracacies of the system and what has already happened without it appearing stilted. This meant that nothing much happened for most of the book - it retold the last book, took us through teenage love angst and used lots of lovely made up words to explain their rather baffling society. These words are explained at the back of the book but as I was reading an electronic copy I didn't find this until the end! Towards the end of the book there is a flourish of action which hints that there could be a really decent story to be told but it is over in a flash, the baddie defeated, the lovers reunited, not all quite sorted though as obviously setting up for the next book. Sometimes I would like to read a book with an actual wrapping up of the story and proper ending not a hint of things to come.Having said all that I liked the characters, I liked the fact that the female lead was strong and feisty and making her own choices not waiting to be rescued and I thought the book was very imaginative. I may well go back and read the first one and I would recommend it to early teens upwards. They all do like a bit of forbidden love don't they! I really enjoyed this book even though it was slow reading at first. I think this book answers the question of what happens after you learn that the life you have and the religion you believed in are all based on a lie. Book Two of the Tankborn trilogy answers that question in part as we continue to follow Kayla in the aftermath of having her world tossed upside down. Kayla now has something to fight for while trying to figure out her feelings for Devak. What I love the most is that Kayla challenges everyone to think about their motivations when making a decision. Are you making that decision on her behave? If so she doesn't want to you to. How can people view her as fully human when they think they know better than she does about her life? Oh but Kayla doesn't make it about herself, she really is focused on changing the way trueborn, low born and GENs think of themselves in the world since the world is a-changing. This novel continues the story started in Tankborn and amps up the drama and the chaos even more. I know that a lot of folks maybe over romance in YA novels but I think the hint of one between Devak and Kayla is important because it illustrates deeper issues of the society that they are part of. I still like this world, and I still like the basic premise of these books of just how difficult it is, societally, to break out of a class-based system of oppression. The themes of body and personal autonomy are also important in a book like this, and I appreciate how the author brings these across (even if all the desire in the world for autonomy, in this book, results in people violating that anyway). However, the main character and the prolonged, endless, self-imposed idiocy about her love interest got to the breaking point of annoyance in this book. The romantic storyline could have been removed entirely and the book would have probably been better with fewer distractions from the other interesting stories. I found that my annoyance at every single mention of lovers' angst tainted the whole story around it, no matter what the context was, and unfortunately it seemed that they lovers either avoiding each other or brooding over each other was the impetus for most of the actions in the story. I get that it's complicated when love happens across class divides, but I wish it had been more lightly handled instead of having their angst shoved onto every other page. I didn't like this book as much as I liked the first one of this series, Tankborn, but yet I didn't dislike it either. Although not mind blowing, it was a good sequel to a story with an interesting concept.In this book, Kayla, a GEN (Genetically Engineered non-Human) belongs to a secret force called the Kinship that is trying to save GENs from their life of slavery. It reminded me of a very updated Underground Railroad story. She has very little contact with Derek, the high-born boy who was so prominent in the first book. A love between them is not possible. Into this drama comes a deadly new disease called Scratch that only affects GENs. Between that and the bombing of GEN warehouses with the only clue being left is F.H.E.- Freedom, Humanity, Equality-the Kinship has its hands full and Kayla is right in the middle of it. I enjoyed this. While not a huge fan of YA, I jump at the opportunity to read a book with a multiethnic cast of characters, and where the protagonist isn't the usual cardboard cut out.I'm also not a fan of sappy romance, but I do like this one as its more than mere "love" but is intertwined with issues of class and race and sacrifice. Here we have freedom fighters, mystery and political/social/scientific intrigue and tough choices. These characters are put through the paces, forced to challenge their own notions of right and wrong, good and bad. this is just what a book should do. I look forward to the third book on this series. Intriguing and enticing, this was a wonderful follow-up to Tankborn. A new plague is spreading quickly, but it only affects GENs. GEN buildings are being bombed, but the cause is a mystery. And Kayla is dealing with a new and unknown group connected to both problems. As she does her best to keep helping the Kinship, a group dedicated to fighting for Lowborn and GEN rights, her loyalties are questioned when she discovers a power play being executed. It was a good sequel, and I'm excited for the third book! Wow, what a cliffhanger! And now I have to wait for the NEXT book to find out what happens!! !How oh how to write about this for my Girls of Color in Dystopia blog series without inadvertently spoiling the ending of Tankborn? 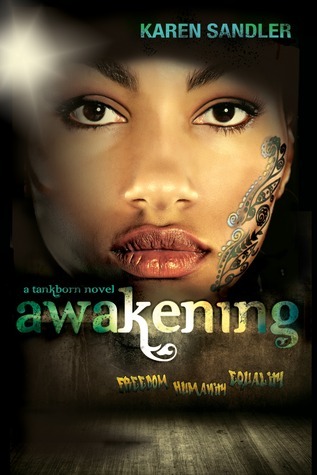 Awakening is definitely the best second book of a trilogy I have ever read. I like it as much as if not more than Tankborn. I was literally speechless when I finished reading and have no idea how I'm going to be able to wait until the third book comes out! This is the second in the Tankborn series and it follows up the first book with the characters trying to find a way to help the GENs and ultimately find freedom for them. It wasn't a bad book but I did find it a bit slow in the middle but it did pick up and get more interesting at the end. Like the first book, it kept me wanting more and more!.Like the first book, it kept me wanting more and ready to purchase the next book. This would really be a much better movie than a lot of the dystopian movies already put out. I hope it gets noticed. It was very nice and interesting. Powerful sequel that really makes you think about freedom, humanity and equality. Love this series, hard to put down, well written. Kept me hanging on. The struggle and triumph, such a great story. Plot somewhat predictable. That being said, I am curious about how the author will handle the twists and turns of Kayla and Devak's relationship and the chaos on their world.